The 2011 NFL Draft is just 12 days away, folks. This is the third part of a seven series installment in which each pick for each round of the Giants’ will be profiled. I predicted the Giants’ would draft Jason Pierre-Paul, Mitch Petrus and Dennis Landolt (UDFA) last year. I had some wrong, too. I had James Starks going to them in the fourth round, but he didn’t. If Mason Foster is still on the board at pick 83, I think you’ll see Perry Fewell drool. Foster has experience playing all three (SAM, MIKE & WILL) linebacker positions, which means he has the ability to be spread out all across the field. One thing I love about Foster is all reports say how great of a leader he is, something the Giants’ lack in the linebacking area. He has a high motor and it never seems to stop. Had tremendous production in his senior season racking in 162 tackles with 6.5 sacks. He still needs improvement in coverage, which could be a reason he doesn’t see much of the field right away. Ran a respectable 4.75 forty, but an impressive 1.59 10-yard split. 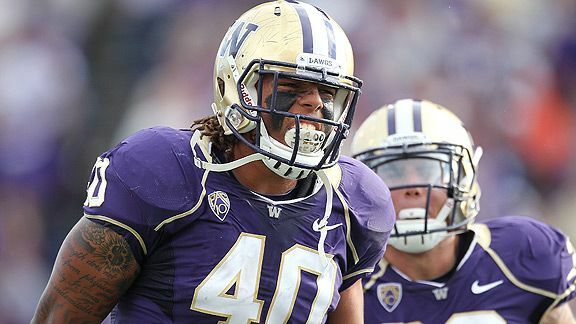 I still think at the end of the day, Foster will be an inside linebacker, but his experience can allow him, at times, to play all over the field, something the Giants would love. I don’t know if he’s there at 83, his stock seems to be rising. If he isn’t there options at 83 could include running backs such as DeMarco Murray, Daniel Thoman or a Taiwan Jones. They could look for a TE such as Luke Stocker or even Lance Kendricks. That’s just the offensive side of the ball. Other options could inculde a safety or a defensive tackle. The current linebacking guys the Giants have just wont cut it. Right now, you have two starters in Jon Goff and Michael Boley. Goff needs to continue to improve. Keith Bulluck was a stop gap guy, he won’t be back next season, and Clint Sintim couldn’t crack the starting rotation. He also will be coming off a torn ACL, which means he probably won’t be the same this year. Chase Blackburn is a special teams guy, and Gerris Wilkinson is a free agent, who could be brought back to compete and be a specials guy, too. The last time the Giants’ took a LB was last year in the 4th round when the took Phillip Dillard. Yeah…maybe. I still can’t help but think that third round linebacker talent isn’t the solution to the LB woes. I think we can still get someone who will be more of an impact player in the third round, rather than another LB who we are going to have to sit on for a few years before he is a serviceable starter, let alone a defensive leader. But then again, we don’t know if we don’t try. So maybe. I think we keep going offense. I’ve seen Titus Young falling to the third in a few drafts. I still like RB Jordan Todman from UCONN and I like WR Tandon Doss from Indiana that Fuchs profiled. So hard to say who is going to be around in the third. But all these guys have returner potential, and last years injuries at WR should make us realize that we can never be too deep at WR. Mason Foster is a prospect I cant seem to understand. Some believe is one of the top LB in the draft (probably 2nd round pick), while others believe he is a 5th round pick. I really dont know the answer to the NY Giants LB problem. But I have confidence in who ever they pick. The more I think about it, the more sense it makes to move Goff from the middle to the SAM. For the tampa 2 (very similar what giants run) you need a very quick Middle LB, to cover the deep middle. If you remember last year, the giants were consistently burned in the deep middle, even with having to bring in a safety to play the middle. So I wouldn’t be surprised if the Giants do select an ILB rather then an OLB. But the fact is the Giants have to add a playmaker to the LB core, it could be Akeem Ayers, like him or not, he does make plays, and they could use him as a pass rusher (similar to kiwi a few years back), so i could see the Giants liking him. I don’t see the Giants drafting a WR this draft. 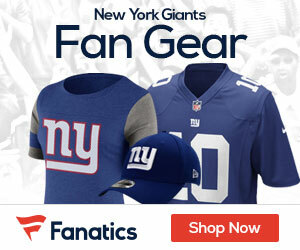 I think they’d sign Plaxico before they went WR this early (I don’t see them signing him, either). I think they’re content with what they have right now. Could they draft a WR later in the draft? Maybe. But not when there’s glaring needs. I’d see them draft a RB before a WR. But all very valid points. Doesn’t hurt to have options. Very valid points, too. Makes sense. I happen to like Ayers. I know some of the other writers here don’t, but I think he could be an effective LB in the NFL for a long, long time. But at 19? Might be to early. If there’s more value at 19 for an offensive linemen or a DT, they might go that way. Ayers seems to be a late first rounder. Foster has a lot of potential. Could help out a lot on special teams right away, too. I like him, but I’m not sure I’ll have him going to the Giants in my final mock draft. Stay tuned! JW – love your work here, keep it up. If you really think he can be an effective LB in the nfl for a long time, then 19 is not a reach. If someone guaranteed you that Player X would be a 10 year starter at a position of need, you would take them in the 1st round. I dont know if Ayers will be good, none of us really “know” how any player will turn out. So whoever they draft, I just hope it pans out. There is no way Ayers slips out of the second round. In-fact, if he is not a top ten pick in the second round I’d be shocked. If he’s still on the board at 30, the Jets’ might end up taking him. Taylor the NT from Baylor seems like a better fit for them at 30, though.